Purported image, not render, of the rumored HTC flagship codenamed M7 has appeared, and allegedly is showing us a glimpse of HTC Sense 5.0, the next stage in the Taiwanese phone maker's own Android coat of interface paint. If this one holds water, then the volume rocker will actually be on the right, the front-facing cam top right, which was conspicuously missing from the latest renders, and the logo on the back will be in black instead of shiny chrome. Moreover, the leaked screenshots of what is claimed to be Sense 5.0, demonstrate a new, cleaner weather widget, and a few Live Tile-resembling widgets that will be present on the home screen for news, social networking updates and so on. I hope this is not the real and final m7, htc can do better than this! We geeks naturally want new design all the time. But building on success is the proven strategy. 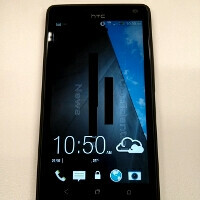 Butterfly is successful and very cost effective design so it's understandable HTC uses the design for M7. SS has been doing the same thing. Actually all SS phones now look like GS3 and sell by truck loads. Agreed. But the design of this phone is more like an android version of the WP 8X than butterfly/DNA. Anyone who disagrees with me, you're welcome to thumb me down. both 8x and DNA have curved glass display. This looks credible, very handsome device. It looks like Butterfly which is not bad. Hopefully the phone will have new cool features more than Butterfly beside the screen size. I agree. HTC never managed a high quality design. They were always good with high quality of materials and good construction but not with design itself. All my product designer acquaintances always regard HTC design well below Apple, Nokia and Sony. I am afraid that for me even Samsung is doing better than HTC in terms of design, apart from materials used. It looks a lot like the WP 8X, maybe with slightly more rounded edges... I mean, the 8X is a good looking device, but I was hoping there would be something that set it apart from the rest of HTC's previous lineup. Also, the status bar reminds me of Gingerbread for some reason, just like it did on the One X. Other than that, I'm liking Sense 5.0.
yeah, i do kind of wish the 8X's design language would stay exclusive to their Windows Phone lineup and their Android line-up gets a different treatment but this isn't a bad thing either. like you said the 8X is a good looking device. o: yeah, HTC's status bar isn't that great looking, there's definitely still some HTC stuff that i still don't like here but from the look of that launcher with the icons and the widgets it looks like this is a good start. It is a good design, but being too repetitive is a bad thing; unless you have a lot of reputation and hype like Apple has, and even they are starting to slip. The 8X was kind of like a smaller, more angled One X with minor face changes, and this M7 is kind of in between there. And something in general I haven't been too fond of in HTC devices is their power button, it's hard to distinguish from the rest of the device with just your finger, and lacks a good tactile feel. Sense is getting better, just not quite there yet. So far, this is definitely a step up from Sense 4. I love HTC, but some of their hardware and software elements are getting weary. Why isnt the home button at the middle? I wonder if the "EVO" variant of this device will take on a different design que. Hmm.. hopefully it does. Flippy clock is now GONE? !